Following her husband Stephen Curry’s ejection in the Golden State Warriors’ Game 6 loss to the Cleveland Cavaliers on Thursday night, Ayesha Curry tweeted the NBA had rigged the Finals for ratings. LOS ANGELES – Following her husband Stephen Curry’s ejection in the Golden State Warriors’ Game 6 loss to the Cleveland Cavaliers on Thursday night, Ayesha Curry tweeted the NBA had rigged the Finals for ratings. Stephen Curry, the two-time MVP, received his sixth foul for grabbing LeBron James in the fourth quarter. Frustrated by the call, he threw his mouth piece into the stands, which hit a fan court side, and was ejected from the game. 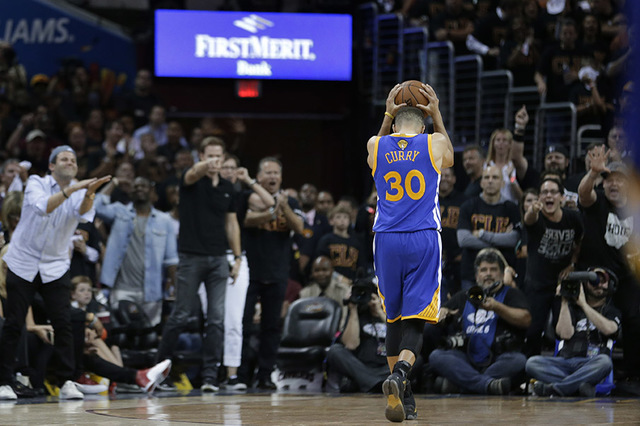 Curry apologized to the fan before leaving the court as the hometown Cleveland crowd showered him with boos. The Warriors lost the game 115-101. Earlier in the series, the Warriors staff expressed frustration with the NBA after star Draymond Green was suspended for Game 5 after flagrantly fouling James. The Cavs went on to win Game 5, which drew over 20 million viewers for ABC. It was the highest rated Game 5 since 2004. Game 7 of the NBA Finals tips off Sunday night at 5 p.m. PT on ABC.